New Year’s resolutions are all about changing your quality of life – making the upcoming year better than before. For this reason alone – GlassesOff can be the perfect, life changing resolution. It takes 12 minutes, 3 times a week for about 3 months. It’s accessible and easy to use. And achieving this goal will certainly give you an appetite to attack the other new year’s resolutions on your list. So here are a few things that can help you stick to your GlassesOff resolution? Get into the groove straight away. Life’s busy. We are all marathon runners (if only we could lose calories while we are at it J). However, 12minutes, three times a week sounds like a small toll to pay in achieving such a big goal. Hold your favorite newspaper or magazine at a pre-decided distance (for example at the recommended 40cm reading distance), and test your vision. Repeat this before initiating the program and after completion – you will be able to SEE the difference. This baseline will enable to create a real practical measurement of your visual improvement in your daily life. Again, 12 minutes 3 times a week is totally achievable. Set yourself reminders at three comfortable times during the week and stick to them – the program helps you create these easily. Don’t be alone, take a friend/colleague/partner for the ride. It is more fun and a great motivational booster. See the result – envision it, do it, SEE it! Imagine not being worried about forgetting your reading glasses. Remember your goal every time you read – how it would be amazing to improve your reading experience, without any strains. You will not need a professional to tell you of your improvement, you will see it with your own eyes. And there will be nothing more satisfying than this. Big goal, short time to achieve it, minimum life changes required. The recipe for a perfect New Year’s Resolution! 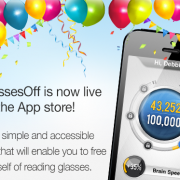 December 10 2013 GlassesOff Beta for Android is here!